Onwon trading LTD is now the distributor of DNA diagnostic. DNA Diagnostic's HemaVision uses reverse transcription of RNA followed by multiplex PCR, and used by clinical laboratories to screen RNA for genetic defects associated with the development of leukemia. Onwon trading LTD is now the distributor of AnyGenes. Since more than 10 years, AnyGenes brings attractive all-in-one solutions to analyze any signaling pathways, in any species, in less than 3 hours, with high reliability and at low-cost. Onwon is now distributing peptides from ONTORES that offers innovative solutions for antibodies, building blocks, oligonucleotides and peptides. From 1 June, Onwon Trading is the exclusive distributor of TargetMol! Inquire after us for inhibitors or inhibitor libraries now! Onwon is the official distributor of RevMAB Biosciences! They focused on the development of goat and rabbit monoclonal antibodies using a revolutionary technology. Midori green: Substitutue your toxic EtBr! 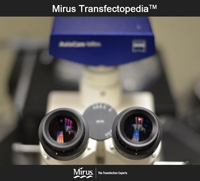 Mirus Brings you the Reagent Agent -- Directly search by cell type and nucleic acid and Mirus will suggest the suitable transfection products for you! Want to try? Click here! AnyGenes® has developed and optimized the SignArrays® system with it range of Perfect Master Mix SYBR Green to guarantee highly specific, reliable and reproducible results, even with small amounts of precious samples like FFPE or LCM samples. In less than 3 hours, with high reliability and at low-cost. In Europe, AnyGenes® experiences a continuous increase of interest in their company by many researchers and biotech companies. Academic researchers are very satisfied with AnyGenes® solutions, leading to growing citations of their products in high impact factors of international scientific journals. Please CLICK HERE to view all signaling and disease pathways offered by AnyGenes. Goes from Biological Sample DIRECTLY to PCR! Acid Staining Solution :Replace your toxic EtBr! 8 laboratories are currently using Midori Green in Hong Kong since our launch in November 2013! Nippon Genetics started 3 years ago with the introduction of a dye called Midori Green as an alternative product for Ethidium Bromide. The main features are non carcinogenity and significant less mutagenicity in comparison to Ethidium Bromide, and with comparable sensitivity for a very competitive price. The wonderful feedback from scientists all over the world lead to the fact that they developed 2 new dyes for visualization of DNA and RNA in agarose gels. Why continue to put yourself and your lab personnel at risk? Purchase a sample size of Midori Green and make the safest choice! 06-2016: The whole website is renovated! 07-2014: New Promotions are updated! 02-2014: Welcoming page is renovated!